This entry was posted in Randy's blog entries on November 2, 2018 by randy. And, The Dichotomy of Leadership by Jocko Willink and Leif Babin was well received. It is a good follow-up to their earlier book Extreme Ownership. I’ll be posting my lessons and takeaways from each of these books soon on this blog. And my synopses, with the audio recordings from this morning’s session, along with the pdf of my multi-page, comprehensive synopsis handouts, will be available soon at the buy synopses tab at the top of this page. (Click here for our newest additions). If you are in the DFW area on Dec. 7, plan to be with us for our December 7 session of the First Friday Book Synopsis. 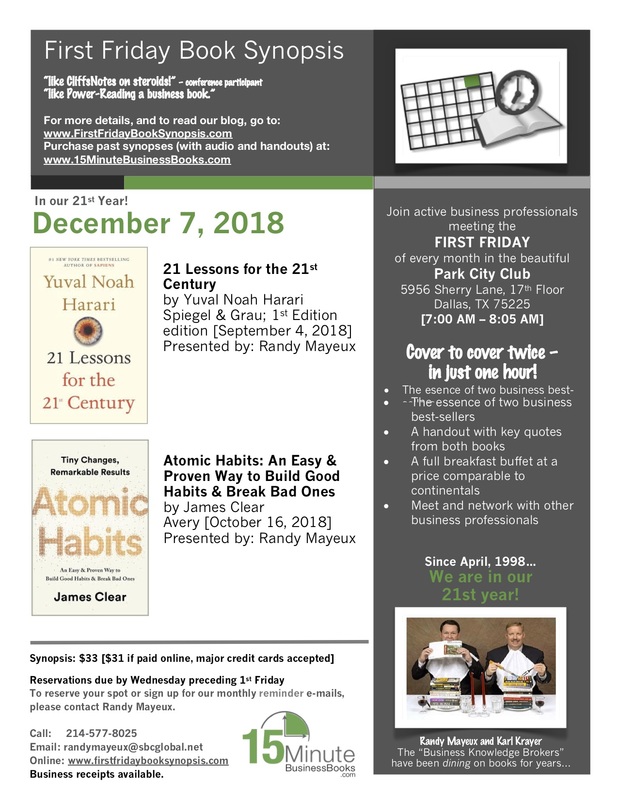 I am presenting my synopsis of the new book on building good habits (and getting rid of bad habits): Atomic Habits by James Clear. And I am also presenting the “big think” book by Yuval Noah Harari, 21 Lessons for the 21stCentury. (I have presented synopses of his two earlier books: Sapiens and Homo Deus. Those synopses are available at our buy synopses tab). And two thorough, useful book synopses. Here’s the flier with all the details. You will be able to register soon from the home page of this web site.